Ok, so I haven’t done any work yet like I should have today. I started putting together my RFTS center and based on the layout, I wanted to put the opposite corners together first. Then I was going to stop there, get some work done and – you know – if there was time, put some more together. I even folded these sections up and set them to the side for tomorrow or later this week. Then, maybe 10 minutes later, I thought … well – I’ll just do a couple more blocks together to have a head start. I really can’t believe how easy it came together and how much it looks like the cover photo from a distance like this. I really, really love it and I can’t wait to get it finished. I was stitching while watching the GB/Seahawks game. That was a crazy game, right? And I don’t normally watch football, but that was a good game to watch. The other game, not so interesting. Did you have a great weekend? I hope you got to do some stitching as well! It looks great Jennifer! How exciting!! Looks great but are you going to do the pieced boarder. I did. Having a hard time getting them to fit. Very confused about the corners. There is a piece (cc) that I am guessing at the size since my copy is digital and I’m not sure it’s accurate. I wish they would have given a measurement. 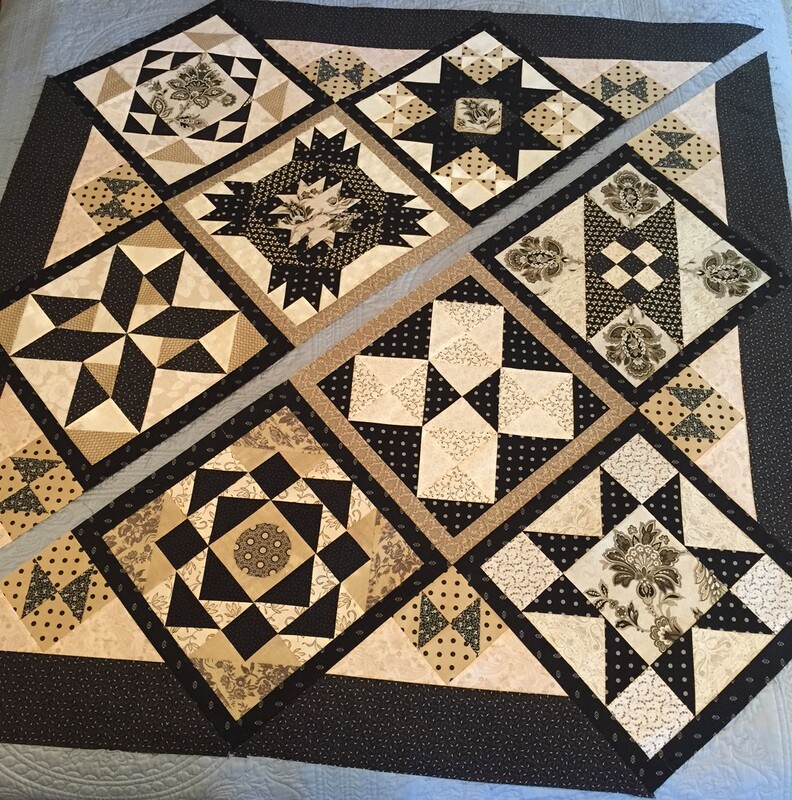 Hi Carol – I have not started the pieced border yet unfortunately. No measurement? I guess I haven’t studied it closely enough yet. I will look at my hard copy of the magazine tonight and see if I can find one for you! 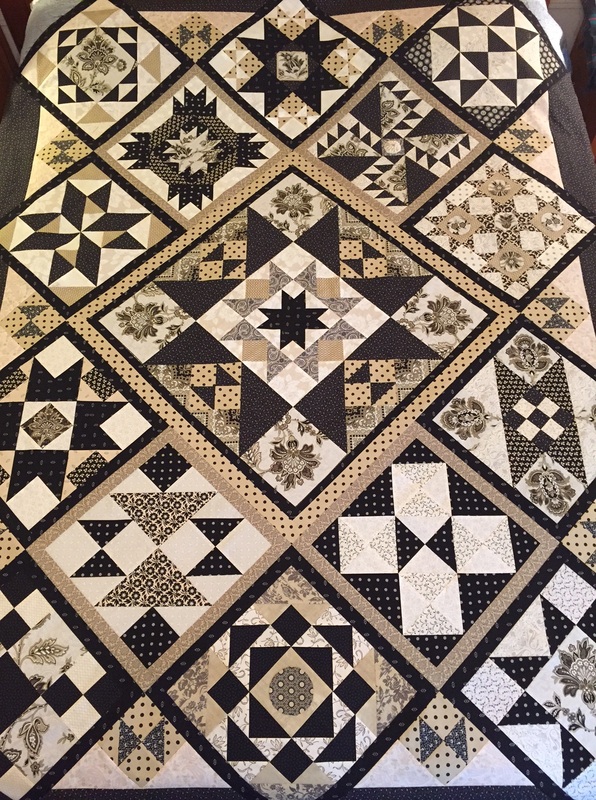 Did you ever completely finish this quilt? I am ready to sash my blocks, having a difficult time deciding. I wish I could say I have finished, but I’m still left with the outside pieced border, made up of those 9 patch units. When I went to build the body of the quilt though, I didn’t have much problem with the sashing and matching up seams. I pretty much followed the color scheme offered in the original publication. I would love to see your blocks though! I have gone with a green and a beige for the sashing. School started back and sewing time is minimal until I get into a routine that doesn’t include rushing, rushing, rushing. How do I figure out the size of the setting triangles with that four patch and two other fabrics? 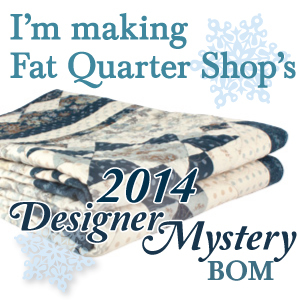 You can email me at Annette.holder@nettletonschools.net and I’ll share images of my quilt so far.